Protein, fats and carbohydrates are macronutrients that are essential to a healthy diet. Macronutrients need to be consumed in large supplies in the diet to provide energy, promote growth and maintain healthy organs and tissues. Potatoes are perhaps best recognized as being a rich supply of carbohydrate, but they provide several other nutritional benefits as well. One potato provides 3 g of protein to the diet, according to the Washington State Potato Commission. Protein contains 4 calories per gram, so a potato contributes about 12 calories from protein. Protein should generally account for 10 to 35 percent of your total calories, with more highly active people requiring more protein, according to MayoClinic.com. Potatoes are both fat-free and cholesterol-free way to satisfy hunger. Nevertheless, some fat is actually needed in the diet. The body needs about 44 to 78 g of fat each day to help absorb vitamins, help produce hormones and maintain cellular health, notes MayoClinic.com. Potatoes are high in carbohydrate, contributing 26 g of this macronutrient to the diet. Carbohydrate contains 4 calories per gram, so potatoes contribute over 100 calories from this nutrient. While potatoes contribute an abundance of carbohydrate, they are high in starch and carry a high glycemic index (GI). The glycemic index is a numerical scale used to indicate how fast and how high a particular food can raise the blood glucose level. As such, potatoes can produce a spike in blood glucose levels. Foods with high GI's are linked to diabetes and heart disease. 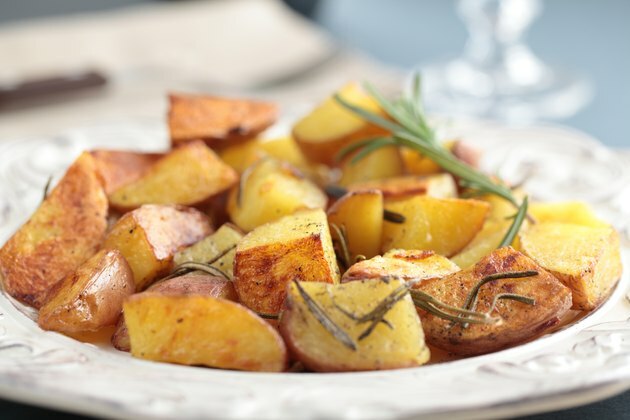 In addition to the three macronutrients, potatoes are full of vitamins and minerals. One potato provides 45 percent the recommended daily value for vitamin C, according to the Washington State Potato Commission. Potatoes also contain an abundance of potassium and traces of thiamin, zinc, riboflavin, folate, magnesium, iron and phosphorous. Vitamins and minerals are essential for maintaining cellular health and assisting with all of the body's normal functions such as respiration and digestion.